Although there has been substantial research on enterprises; information on their financing needs is quite limited. Small business entities are often viewed by financial institutions as relatively risky. In this light, the European Union (EU) continues to reaffirm its support for the small and medium sized enterprises (SMEs). As a matter of fact, the EU has drafted the ‘Small Business Act’ in 2008 and has refined it again in 2011. Another example of the EU’s commitment in this regard is conspicuous as it frequently calls for research and training schemes in the subject area of ‘SMEs’, where grants are issued under ‘Marie Curie’ and ‘Cordis FP7’ programmes. Very often, small firms tend to find themselves in an equity gap, where it may prove quite hard to acquire capital. Although commercial banks are key providers of finance for many enterprises through the provision of loans; unsecured debt finance without collateral is very limited. Therefore, SMEs’ growth into viable investment opportunities may be severely restricted. Throughout the years, the EU has dedicated several funds to help these small (and micro) enterprises. Recently, the EU’s Enterprise and Industry Division has reiterated the importance of improving access to finance for SMEs. This interesting development has led to numerous funding schemes and to a new generation of financial instruments that support SMEs’ financing needs. 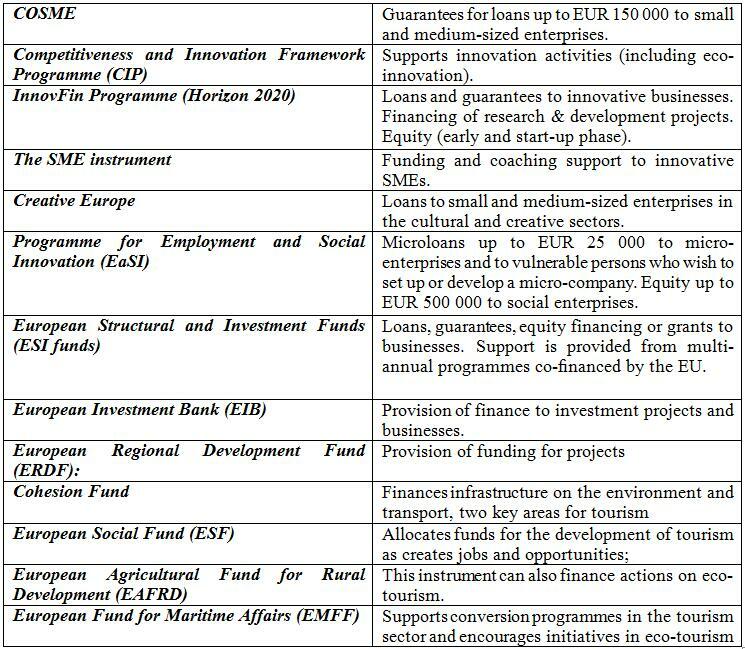 Evidently, the EU has committed itself to boost its support for SMEs through various financing programmes, as illustrated in Table 1. Reducing the legislative and regulatory burden on SMEs. Almost 220,000 SMEs profited from the Commission’s Competitiveness and Innovation Framework Programme (CIP) programme (EU, 2013). CIP has proved to be a very successful programme over the past few years. Since 2007, there were many SMEs that had benefited from CIP Funding . In fact, CIP was able to stimulate more than €15 billion of financing for SMEs, so far (EU, 2013). With a budget of €1.1 billion (CIP) has helped to mobilise over €13 billion of loans and €2.3 billion of venture capital for SMEs across Europe. Under its SME guarantee facility, CIP has helped nearly 220,000 SMEs to access loans. These loan guarantees are required by individual entrepreneurs or small enterprises that do not possess sufficient collateral. Every euro that is dedicated to guarantees will in turn stimulate 30 euros in bank loans (EU, 2013). EU (2015) Improving the financing environment in Europe. http://ec.europa.eu/enterprise/policies/finance/financing-environment/index_en.htm accessed on the 20th January 2015. EU (2013) Improving access to finance for SMEs: key to economic recovery. http://europa.eu/rapid/press-release_IP-13-387_en.htm?locale=FR accessed on the 20th January 2015.